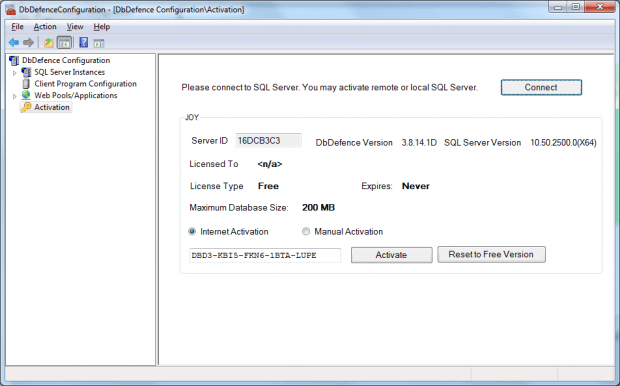 In order for you to use full version of DbDefence, software activation is required. In order to activate the software, you must insert your purchased activation code into the software once it has been successfully installed. The entire activation process is quick and easy to complete. If you obtain a redistribution license, you will be able to avoid the interactive software activation process. Each software license is bound to the computer name of the system in which it was initially installed on. You can change any hardware within the given system, but in order to continue using the software, you must use the same computer name or buy a new license. Internet Activation can run from ANY WORKSTATION that can connect to the Internet as well as to the target SQL server at the same time. In order to select the Automatic Internet Activation as the method of activation, you must log first in to SQL Server. The activation program requires this step in order to calculate the unique Server ID and to set the registration information. 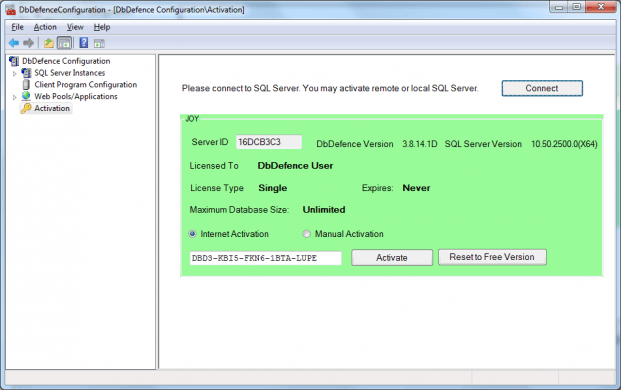 Assuming you have a connection to both the SQL server and the internet, you will simply start DbDefence Configurator and navigate to Activation item. You will then need to enter your activation key and press Activate You typically receive your key from ActiveCrypt Software by email after you make your license purchase. If you have no Internet access on your workstation, you can manually activate the software by using the following steps: How to activate the software manually.